Maurice Cox has a radical vision for Detroit. He sees its salvation in fallow land. By some measures, 24 of the city’s 139 square miles are vacant, the product of decades of abandonment that’s seen Detroit’s population fall by more than half since 1950 to less than about 670,000. “For decades, American cities that were shrinking saw vacant land as a noose around their necks, dragging them back,” Cox told Bridge Magazine. “Cities that approach it creatively and entrepreneurially can actually create the new American city. 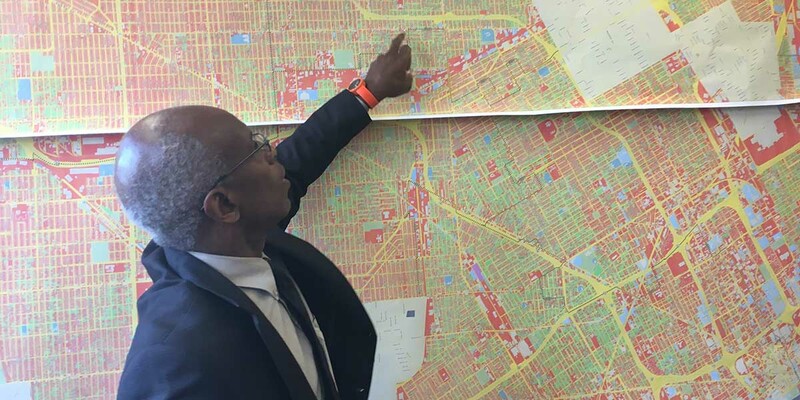 Slender and bespectacled, and working in an office decorated with maps and African sculptures, Cox is the architect of Detroit Mayor Mike Duggan’s plans to reshape neighborhoods. Unlike previous administrations, Cox’s vision includes no grand promises of restoring lost population. But it does involve patience. Rather than spreading limited resources throughout the city, Cox’s plan first targets three broad areas of the city (Livernois/McNichols, the Villages/East Riverfront, and Southwest Detroit) in the hopes of achieving quick successes that can be replicated one day in other neighborhoods. It’s a strategy that’s not without controversy, sparking accusations of City Hall picking winners and losers. And its reliance on green space isn’t entirely new, building on a blueprint laid out in 2013 by Detroit Future City, a massive civic engagement and planning project set in motion by then-Mayor Dave Bing, that Cox said made it easier for residents to accept the idea of smaller, more verdant neighborhoods. The first test of that vision is in the Fitzgerald neighborhood in northwest Detroit, where the city is stitching together vacant lots to create mini parks, urban farms and quarter-mile path from University of Detroit Mercy to Marygrove College. The project also will rehab 115 homes. Cox started in May 2015, arriving from New Orleans, where he was director of Tulane City Center, a design center for the city, and an associate dean of the Tulane University School of Architecture. Bridge spoke with him recently about his vision for Detroit. The conversation is edited for length and clarity. Detroit’s challenges are well known. How do you begin to rebuild? I started doing driving tours. I have to say, it wasn’t a happy tour. I was looking for something a little easy, and there was nothing easy. You had areas of strengths, but right next to them were areas with considerable challenges. You don’t go to the most challenging neighborhoods and try to produce some wins. You go to your strongest neighborhoods – which, by the way, still have big gaps in service and amenities – and you try to fill those gaps and see if you can’t produce a quicker success. I want to make a 20-minute neighborhood, which is a concept I borrowed from Portland, Oregon, that says you should be able to shop, recreate, get to public transit within a 20-minute walk or bike ride from your house. Detroit traditionally has viewed vacant land as something to overcome. How do you view it? Without question, it is the City of Detroit’s largest competitive advantage with other American cities. Because this administration was smart and pulled all those resources into one single place (the Detroit Land Bank Authority, which owns 96,000 parcels, about a quarter of the city), Detroit is able to go into a neighborhood with 100 lots, 200 lots, 300 lots and make change happen. There’s no city in America that has the same infrastructure. I’ve already seen it. It’s called rural land. Traveling between one city and another in Michigan, I don’t think anyone thinks, “Oh, this looks horrible.” It actually looks pretty gorgeous. We have the opportunity to have the country in the city. Is there a tipping point where neighborhood success spreads citywide? You are seeing that already in areas like the Villages and Southwest. These are areas where you are seeing first new construction they have seen in a long time. (Elsewhere) it could be incremental, four years. Detroit has extra money from the bankruptcy now, but a recession is forecast in the next year or two. How much of your plan is contingent on a strong economy? Now is definitely the moment. It certainly helped to clear the debt through bankruptcy, which was strangling reinvestment in the city. It helps to have a balanced city budget. Most importantly, it helps to have the confidence of the private and philanthropic sector who see Detroit operating smartly. What we have to do is continue to ready these planning areas for investment and put a framework in place that can withstand the economic swings. What do you say to the people who have stuck it out in Detroit for 25 years who aren’t in areas targeted for revitalization? People have been waiting for a very long time. We can show progress through much smaller, incremental steps and smart investments that produce change and give people some reason to hope. We may not be in every neighborhood in Detroit, but if you see it working in a neighborhood that looks and feels just like yours, it gives you a little more confidence that, if they can do it in their neighborhood, it can be done in mine. Former Emergency Manager Kevyn Orr called Detroit the Olympics of restructuring. Is Detroit the Olympics of city planning? This is the biggest opportunity that I’ve been given in my career to really make a difference in people’s lives. I’ve been in rehearsal for this moment for decades. I’m constantly reminded of how much work there is to do just because of the sheer size of the city, but you measure success in increments. Am I trying to create a blight-free 139 square-miles? Listen, I’d be happy to take a 20-minute walk and not see an abandoned house. I think that’s a very achievable goal, and we can do that over and over again. We are going to be working on this for a generation. No question. But the magnitude of the challenge has forced Detroit to be an innovator in neighborhood rejuvenation. I can’t go to Philly and find an answer because they’ve never had a neighborhood with 20 acres of vacant land. Nobody has written the playbook and that’s where, quite frankly, great things happen. And that’s where I feel like I’ve been given an opportunity of a lifetime. Mayor Duggan is committed to all of Detroit, and Maurice Cox is an example of forward thinking. Detroit did not decline in a year and will not come back in a year. If you know the history of Chicago, it was a 100 year plan. It will take vision, patience and support, including tri county collaboration. I am happy to see a visionary planner in both Cox and Dugan. I would love my grandchildren to experience the Detroit I once knew.